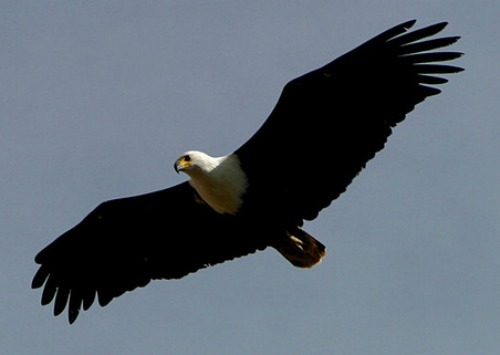 An introduction to eagles wings is revealed in God's Word: One shall ascend heavenwards towards God, swiftly and strongly, as on the wings of an eagle (Isaiah 40:28). Scripture identifies a trait of the eagles wings in that an eagle stirs up her nest, fluttering over her young, spreading abroad her wings, bearing them on her wings. So the Lord make you to ride on the high places in the earth (Deuteronomy 32:11 & 13). A Bible commentary noted: The goodness of God is depicted. He is pictured as a Father-figure, caring of His people in every dimension of their lives, guiding and providing for them. Scripture reveals: You have seen what I did to the Egyptians, and how I sustained you on eagles wings and brought you to myself (Exodus 19:4). Because of their strength eagles had been a symbol of war and power since Babylonian times. The strength of the eagle is equated to God's people under His care and provision. Scripture reveals: Have you not known? Have you not heard, that the everlasting God, the Lord, the Creator of the ends of the earth, faints not, neither is weary? There is no searching of his understanding (Isaiah 40:28). God reaches out to all persons and is not at a loss to provide for His people. He can lift one up above their present circumstances, as on eagles wings, to provide a means of escape. He can bring vindication before one's enemies, and eternal celebration of His goodness (Psalm 23). Scripture reveals the importance of man, in saying: What man of you, having a hundred sheep, if he lose one of them, does not leave the ninety and nine in the wilderness, and go after that which is lost, until he finds it (Luke 15:4-5). This parable of the lost sheep reveals the Lord's concern for every individual! Jesus, the Son of the Living God, in mourning over Jerusalem, said: O Jerusalem, Jerusalem, you that kill the prophets, and stone them which are sent to you, how often would I have gathered your children together, even as a hen gathers her chickens under her wings, and you would not (Matthew 23:37). The eagle is used as an illustration towards those who opposes God's will. When Israel of old rebelled against God; the Word of the Lord came through the prophet Hosea, saying: Set the trumpet to your mouth. They shall come as an eagle against the house of the Lord because they have transgressed my covenant, and rebelled against my law (Hosea 8:1). In the prophet Obadiah's time Edom thought it was secure from all its enemies because of its inaccessibility. In declaring this misconception, Obadiah cried out: Though you exalt yourself as high as an eagle, and through you set your nest among the stars, I will bring you down, saith the Lord (Obadiah 1:4). Babylon declared herself, in like manner, saying: I sit a queen, and shall see no sorrow. But her plagues would come in one day, death, and mourning, and famine, and she would be utterly burned with fire: for strong is the Lord God who judges her (Revelation 18:7-8). She had become the habitation of devils, and the hold of every foul spirit. Her sins had reached unto heaven, and God remembered her iniquities (Revelation 18:5). Eagles wings can be of a merciful nature, such as carrying of its young upon its wings, or of a destructive nature by zooming down upon its prey. Many once godly nations are flirting with God's judgment; with allowances being made to accommodate the ungodliness of man. There is a tugging match between good and evil that far surpasses yesteryear. God's Word reveals that He is longsuffering toward us, not willing that any should perish but that all should come to repentance (2 Peter 3:9). That has been the hope throughout all generations; but note the words "should come to repentance" rather than "will." Scripture tells us that God so loved the world, that he gave his only begotten Son, that whosoever believes in him, should not perish, but have everlasting life (John 3:16). Again note the words "should not perish" rather than "will" because all will not accept God's sacrificial gift to mankind. Scripture reveals: He that believes on the Son (the Lord Jesus Christ) has everlasting life: and he that believes not the Son shall not see life; but the wrath of God remains on him (John 3:36). When apostle Paul witnessed to King Agrippa, he said to Paul: Almost you persuaded me to be a Christian. Paul's response: I would to God, that not only you, but also all that hear me this day were both almost, and altogether, such as I am (Acts 26:27-29). King Agrippa confessed that he was close to believing Paul. It is sad that one can come so close to acceptance; yet, walk away not being wholeheartedly convinced. We see this today because of many distractions that one may embrace rather than being taken on eagles wings towards a heaven gain! God's Word reveals that all have sinned and come short of the glory of God (Romans 3:23). The wages of sin is death; but the gift of God is eternal life through Jesus Christ our Lord (Romans 6:23). God commended his love toward us, in that, while we were yet sinners, Christ died for us (Romans 5:8). By grace you are saved through faith; and that not of yourselves: it is the gift of God (Ephesians 2:8). And finally, as many as received him (the Lord Jesus Christ), to them gave he power to become the sons of God, even to them that believe on his name (John 1:12). On the day of my salvation (some 40 years ago); I felt as if I was taken to great heights on eagles wings, soaring above any problems at hand, with a peace that surpasses all understanding (Philippians 4:7). Yes, I had to come down from such a lofty perch but I thank God; that the Lord, and that of God's Spirit, have been continually with me since that day! You can share in such an experience; for God is not a respecter of persons (Acts 10:34), what He does for one He will do for another, though the saving grace of His Son, the Lord Jesus Christ!